Today I am 22 weeks and one day pregnant with our newest little guy -- the exact gestational age I was when I delivered our son Zachary nearly six years ago. Historically, this has been an emotional milestone for me, and today really is no different. In an average pregnancy (and really even in my pregnancies), there is nothing particularly threatening about being 22 + 1, but in my case, I just can't help but remember how one average everyday turned into possibly the most sorrowful point of my life. Though the tears still fall when I read Zachary's birth story and recall his death, I am so deeply moved by the Lord's faithfulness towards me in those dark moments and beyond. There were sleepless nights and hard questions to ask, but He was there and waiting to wrestle. I remember reaching a time of such heartache and confusion that I could no longer find the words to pray for myself, and how the Lord met me there by burdening the heart of a literal stranger who had no idea of the grief I was in, yet who pulled my phone number from the air to call and tell me that she was praying for me. I remember reaching a point where every bit of it went on an alter, and the work of "trying again" was over. Though my suffering was intense and lengthy, He was there beside me all along, and I am so grateful. His word was truth in my life: "The Lord is near to the brokenhearted and saves the crushed in spirit" (Psalm 34:18). and your husband is too busy laughing at your ten-year-old photographer to have a serious smiling face. And here I am now -- still so surprised to be once-again pregnant, and so amazed to be moving along nicely in this surprise pregnancy. For all intents and purposes, I am as infertile as I've ever been. Besides the placement of a transabdominal cervicoisthmus cerclage to assist in preventing late-term losses, I've had no fertility surgery, no procedure, not one thing done to rationalize the unexpected and explosive growth of our family. The single explanation I have is that we're walking out a real-life restoration of "the years the locusts have eaten" (Joel 2:25). While part of me wishes I had some answers to this change -- something specific to offer to other women with hearts broken like mine -- I am grateful to be on the opposite side of the abyss. A friend told me yesterday that she's been feeling very sad, missing friends (namely me) who are still busy with the baby stage, and while I wish my friend well, I wouldn't trade long, leisurely coffee dates for anything I have now. 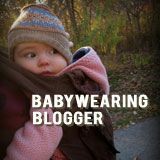 That's not to say things don't get hard and I don't enjoy it when the babysitter comes by, because they do and I do, but my season of unscheduled free-time has been overcome by pacifiers and poopy pants, and I could not be a happier woman for it. Rend your heart and not your garments. slow to anger and abounding in love, and he relents from sending calamity. Who knows? He may turn and relent and leave behind a blessing..."
"He settles the barren woman in her home as a happy mother of children. the fruit of the womb a reward." 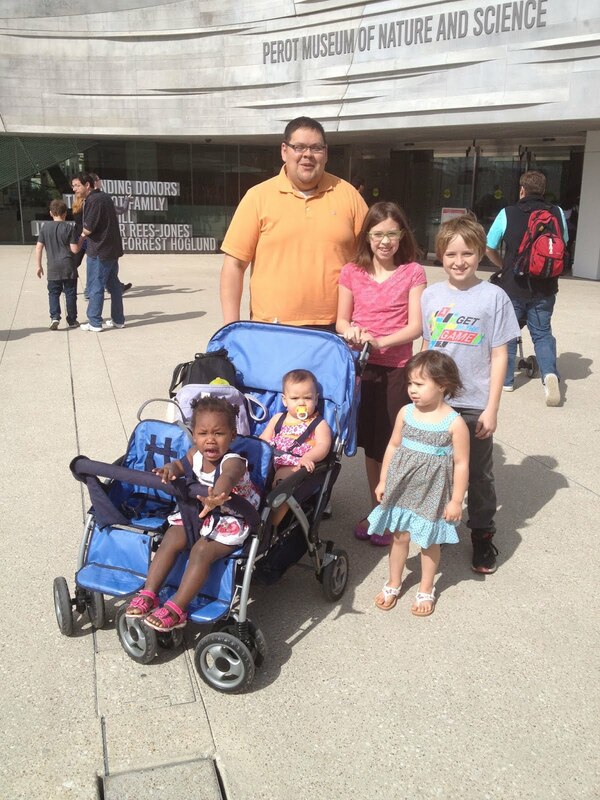 We spent Sunday afternoon exploring the new Perot Museum of Nature and Science in downtown Dallas. It's a state-of-the-art museum with interactive exhibits and a fantastic play area for the preschool set. All in all, it's a really nice addition to the Metroplex. Because it's a new attraction, and because we visited on a sunny weekend day, the place was packed. However, we snagged a surprisingly affordable charter membership before going, so we'll head back over there during special weekday members-only hours (when we'll likely share the whole place with preschoolers and other homeschoolers). Brystol has been in a playgroup with the same bunch of six little friends for as long as she's been alive. Their mommies and I were all pregnant at the same time, so it's been fun to connect a couple of times a month over the last three years to play and visit and watch our little ones grow together. Brystol calls all her playgroup buddies her "best friends," and I really hope it stays that way for a very long time. Since the initial playgroup was formed, two of the other mommies and I went on to add more kiddos to our families (both Elleigh and Piper fall in that second wave), and one of those same mommies and I are pregnant again right now. It'll be interesting to see if the second (and third) wave playgroup participants continue to get together even when the "original members" begin heading off to school. Today was our annual playgroup Valentine party. 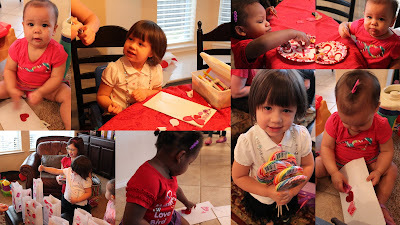 As a simple craft, all the kids decorated white bags with crayons, markers, and Valentine's Day stickers. The bags were meant for the collection of Valentines, which was awesome because I completely forgot to bring containers for my girlies. After craft time, we shared some snacks. For my snack table contribution, I brought some chocolate-dipped marshmallows inspired by Pinterest. The original blogger raved that her marshmallow snacks were super-easy to make, and stated they took her "all of about 10 minutes" to put together. They took me a LOT longer than 10 minutes to assemble, and while my product was no where near as cute as the original, they were tasty -- that is, if you were able to successfully peel away the mini-cupcake liners I carried them in. Needless to say, not a snack I plan to make again anytime soon. In October, our family got a happy surprise. Though we were (and still are) actively waiting to adopt again, I'm pregnant! (Due early July.) We weren't trying for a pregnancy -- no medications, no timetables -- rather, we've just been extraordinarily blessed once again. After years of infertility and recurrent pregnancy loss, this new pregnancy came as an absolute shock. In fact, I still feel stunned, unprepared, and completely undeserving of such a blessing a large majority of the time. I am so very grateful. We made it through the first trimester without any significant upsets. There were a couple of precarious appointments initially, primarily related to those early first sonograms looking for the heart beat, but the issues we had were related to necessary date adjustments and not to any poor development of the baby. 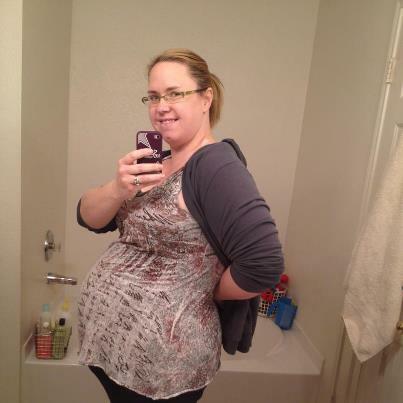 My initial due date was adjusted by eight days, and now baby and I are measuring right on target. With our Playgroup Valentine's Day party just around the corner, the little ladies and I put together some simple valentines for friends. Brystol chose to decorate some giant lollipops we picked up very inexpensively at a local discount store. We used our search engine to find a ready-made sheet of hearts, then printed them on light-colored card stock. She colored the hearts, then attached a little punched circle that read, "I'm a SUCKER for you, Valentine." We easily could have taken things a step further by busting out the stickers and glitter, but since Brystol was content with simplicity, I saw no need to complicate things. My sweet girl was super excited to share these easy-to-make treats with all her "best friends." Doing anything with these two little ladies, however, is anything but easy. Double the grabby hands and double the independent attitudes meant we needed something super easy and quick to make. I looked all over Pinterest for ideas I could implement with things I already had on hand, but I couldn't find anything easy enough for our needs. After pulling together some things from around the house, I had an idea that seemed somewhat unique (with "unique" now being defined as "not easily found on Pinterest"). that we all kept touching the supplies she suddenly deemed her property. As for supplies, we used the same hearts printed on sheets of pink and red cardstock on which we wrote, "All our love, All our kisses... ♥ Elleigh & Piper." I cut them from the sheet leaving a little border around the outline. Instead of hand writing our sentiments, we could have possibly typed them up in Paint or by using a PDF writer. These little hearts would be simple to whip up with a Silhouette, as well (if you know how to use yours -- unlike me). We used clear treat bags picked up on clearance, as well as some unopened bags of Christmas kisses -- also picked up on clearance. We sorted out all of the red and a few of the silver Kisses, leaving the green-wrapped Kisses for some St. Patty's Day treats. All content © Mandigirl, 2007-2013.
hardly anything could be more important. you will recognize that in many ways it is also yours. to each of us most powerfully and personally.